IMPORTANT: Account numbers and log in links are sent to you by email when you create an account. Please keep this information in a safe place. It can take up to 2 days for us to retrieve your account information if you request your account number or login passwords after your Account is created. After logging into your Teacher Account, you will see your "Teacher Dashboard" which asks, "What would you like to do?" This tour is about Adding a New Test, so you would click the "Add a New Test" button. The first thing you are going to need to do is to decide from which Dictionary you would like to create a quiz. Our Main Dictionary gives you the most flexibility. From this Dictionary you can select any word from our database; which means you are not confined to one category of questions. But, if you are designing a "categorical" type Quiz for your students, our Category Dictionaries (e.g. Animals, Baby, etc.) would probably make it easier to create your Quiz. Either way you go, we recommend that you keep a "paper list" of the quizzes you create. It will help avoid confusion when you want to edit a Quiz later on by adding words to the Quiz or deleting words, or changing the testing times for a Quiz. When you edit a Quiz, you will be asked to select the same Dictionary that was used in the creation of the original Quiz. To start, click the radio button next to the Dictionary you would like to use. Then choose how many words you would like to include in the problem set. For example, choosing a 10 word problem set will allow you to choose 10 words from the Dictionary your designate. Each of the words will constitute 1 question in a 10-question Test. (Creating 6 words would create a 6 question quiz, 8 words - an 8 questions quiz, etc.) Each Quiz page has 4 possible responses. One word will be a correct choice on each Quiz page. The remaining words in the problem set will be randomly selected to fill in the 3 distracters (wrong answers) for each question in the problem set. Note: Quizzes must contain at least 4 words and may contain a maximum of 60 words. Now, it's time to start selecting your Content words. Just click on a letter, scroll down to the word you want to include and click the word. It will be added to your Quiz set automatically. To select words that begin with the letter "A," click A above the "Choices" section. To select words that begin with the letter "B," click B, etc. Continue selecting words until your Quiz set is filled. Click a letter-Click a word. If you make a mistake or change your mind about a word, don't worry. Just delete the word. Then select another word to replace it. When you're finished, click "Next Step". Now it's time to define who the Quiz was created for and when you want it to be available to your students (ex: 2nd Period, ASL I, ASL II, Semester Review etc.) This helps the student know which Quiz in the account he or she is suppose to be taking. Creating a specific time frame for quizzes to be available is handy if you want to restrict student access to specific time periods for quizzing or testing for a grade, as opposed to practice quizzes. All times with a start date set to a future date or time will not be visible to your students until that date or time occurs. All stop dates set to a past date or time will not be visible to your students. Multiple Quizzes can be created from any Dictionary. For example, one Test from the "Food" Dictionary could be named, "Food - Pre-Test" and created to be available at the current time. Another, separate Quiz, with "Food - Final Quiz" could be created and made available at a future time, with a specific practice lab day in mind. When finished, click "Complete Test Setup". A recap of your selections will be displayed. 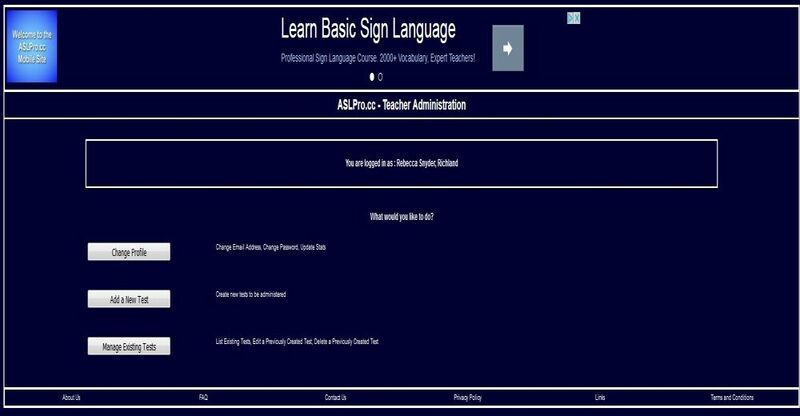 Clicking the "Return to Dashboard" button will send you back to your Teacher Dashboard, as displayed in the first picture way at the top of this guide. Soon after creating your Quiz, it is a good idea to log into your account as a student (on the right side of the log in page, using the student log in information) to check the Quiz and verify that you got the results you wanted.